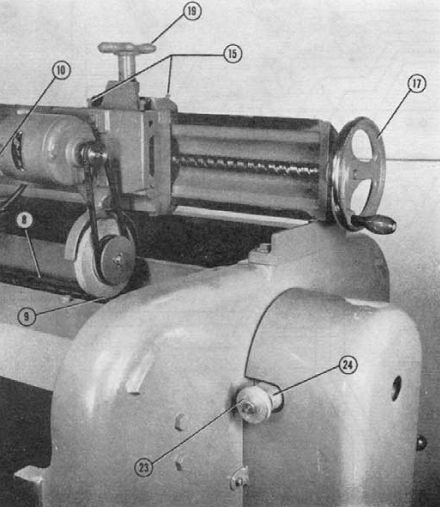 Some planer manufacturers offered as an option with their larger machines a knife grinding and jointing attachment to allow the cutterhead knives to be sharpened in place. A grinding bar is mounted on top of the jointer, to which the grinder attachment or the jointer attachment is affixed. The attachment is then lowered (e.g. using 19 in the photos below) to the correct location above the cutterhead. Typically a handle or wheel (e.g. 17 in the photos below) is used to manually turn the threaded grinding bar, causing the jointing stone or grinder to move across the cutterhead blade(s). It is a two step process, although there is some controversy which to do first, or even if both steps are necessary. Some folks say to grind to the joint and some say you absolutely must joint after the grind. In either case, you need courage to lower that jointing stone onto the spinning cutterhead the first time, it can seem very intimidating. The Powermatic 225 24" planer manual here recommends jointing first, then grinding. 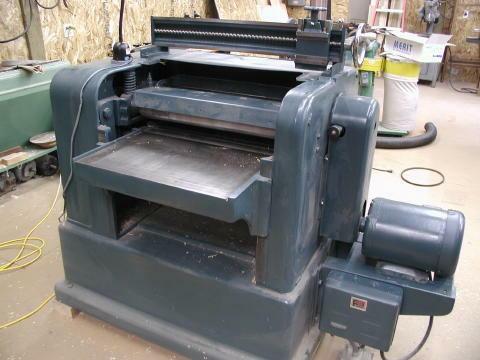 The Yates American J-180 18" planer manual here recommends the opposite order, grinding first then jointing. No two manuals write this up the same. Even the PM manuals have different procedures at different points of evolution. For grinding, the cutterhead is indexed to the proper angle for the first blade and the cutterhead locked into place. The grinding wheel is lowered onto one end of the blade, until sparks just start to fly, and then cranked across the blade. 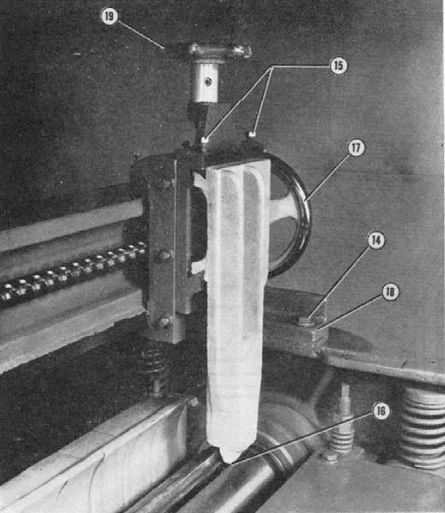 Without changing the height of the grinding wheel the head is next indexed to the second blade and the process repeated. Same for the remaining blade/blades. Blades are ground stationary, one at a time, and all blades are ground before the grinding wheel is sequentially lowered. This process is repeated until all the blades are properly ground. On a cutter head that has three knifes expect to have to make 3-5 passes on each knife to get a proper grind. Thus it may need about 15 passes with the grinder, total. Each pass takes 15 seconds or so. Pretty fast process. The steps are as above but in reverse order. Knives are jointed first, until a silver line is seen on all knives. The knives are then slowly ground one at a time to the silver line using the grinding head. First time through this process there will be a learning curve, indeed it is time consuming initially. With practice, it can be done in under 20 minutes, including dragging out the equipment if required and setup. It really is very efficient, being able to quickly grind and joint the knives is a huge time saver. Plus, it is possible to joint the blades quickly several times before needing to regrind (or vice-versa!). There are proponents of only grinding and of grinding and jointing. Good arguments in both camps. I started with just grinding in the machine. I subsequently added a jointing attachment and much prefer the grinding/jointing process. A number of questions related to setting the correct bevel angles on the process have been raised, but not completely answered in this thread.